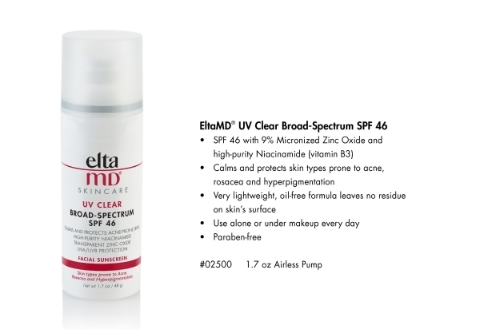 UV Clear SPF46: Oil-free EltaMD UV Clear helps calm and protect sensitive skin types prone to breakouts, rosacea and discoloration. It contains niacinamide (vitamin B3), hyaluronic acid and lactic acid, ingredients that promote the appearance of healthy-looking skin. Very lightweight and silky, it may be worn with makeup or alone. UV Daily Tinted SPF40: Serious UV protection and superior hydration join forces in this sheer facial sunscreen. EltaMD UV Daily has hyaluronic acid to boost moisture retention and diminish fine lines. This lightweight moisturizer with UV protection can be worn alone or under makeup. Choose from tinted and untinted formulas for use every day. UV Physical SPF41: For oil-free sun protection with just a touch of color, our lightly tinted UV Physical is a healthy choice. This chemical-free natural mineral sunscreen has antioxidants to neutralize free radicals. Water-resistant UV Physical withstands water, humidity and perspiration. 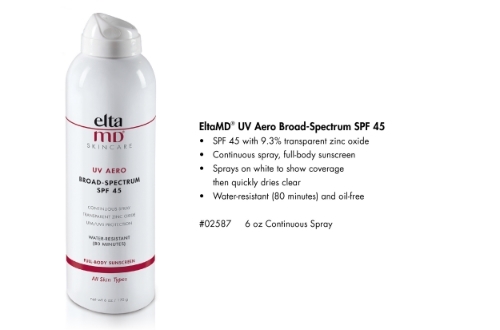 UV Aero Broad Spectrum SPF45: EltaMD UV Aero provides sheer but sure sun protection. This continuous spray sunscreen makes it easy to protect hard-to-reach places. EltaMD UV Aero sprays on white so you can see coverage then dries clear when rubbed in. UV Lip Balm SPF31: This creamy, long-lasting moisturizing sunscreen soothes and protects dry, chapped and sun-exposed lips. 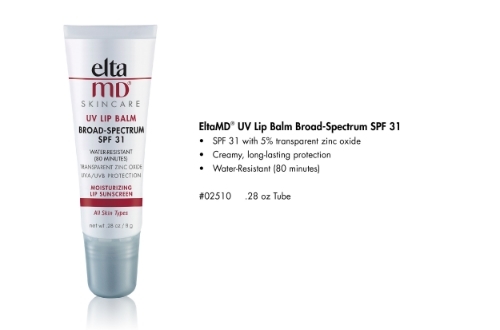 EltaMD UV Lip Balm contains 5% Hydromanil™ for immediate and long-term moisturization. Powerful UV protection and a super hydrating power make EltaMD UV Lip Balm the ideal protector for all skin types and lifestyles.